I really don't believe in coincidences, but I do believe in nudges from God. Two days ago I went to the library to pick up a couple of books I had on hold for my son. While there, I took a few minutes to look around, particularly at the "new release" shelf. 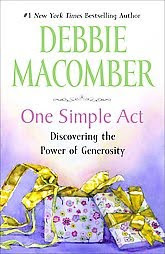 I excitedly picked up Debbie Macomber's One Simple Act. What is interesting about this is that I had just watched an interview with her on an episode of PBS's Knit and Crochet Today. The episode was about charity knitting/crochet. I had just started watching the interview segment when one of the boys woke up, so I wasn't able to catch the title of her new book on generosity. Some may say that I spotted her book at the library because her name was on my mind. This may be true, but if I hadn't watched that fifteen minutes of Knit and Crochet Today (something I rarely do in the mornings), I probably wouldn't have spotted the book. While I was checking out my son's books, as well as One Simple Act, the librarian came across a book on hold for me through inter-library loan. One Million Arrows had just come in--all the way from a library in Washington state! Coincidence? I really don't think so, especially given the spiritual and uplifting nature of the titles. I'm excited to read them and will be sure to add my thoughts about them here at Contentedly Home. I'm also curious as to how they will impact my life and the lives of those around me.